This story first started taking shape near the end of the summer of 1997. My younger brother stepped into my jamming room, threw a disc into my cd player, and insisted that I listen to what an unfamiliar band from Atlanta had to offer. The disc was entitled PIGWALK. At first I didn�t know what to think of this unique genre of music. My playing styles consisted of the typical techniques that one would learn from bands such as Metallica or Pantera, but as soon as I heard the first head-splitting guitar crunch of PIGWALK I knew that it was time to broaden my horizons. I listened to that album non-stop for about a week and every chance I had to pick up my guitar was dedicated to mastering the style of Mr. Rich Ward. About a month went by between the time I starting listening to Mojo and an opportunity to see the band perform. At the time I had just begun my sophomore year at the University of South Carolina in the city of Columbia. A club that previously went by the name of Rockafellas is where my outlook on heavy-metal performances took a drastic change. The show was headlined by Testament with supporters Strapping Young Lad, and Stuck Mojo. The club was packed with fans that could be described as ranging from the most motley-looking metalheads to the prep-poser fratboys. Everyone in that club was about to witness the power of a Stuck Mojo live performance. The lights dimmed and the four members stepped onto the stage. Then the sound of a furious, take no prisoners, skull-splitting unit that consisted of a long-haired, tatoo-covered guitarist, a dred-headed, African-American front-man, a Native-American bassist, and a Ben Stiller look-alike drummer crushed the craniums of all the people in attendance. I couldn�t believe the level of energy in which Stuck Mojo performed. At first it was a little too much to take in, but a minute into the first song I realized that those guys were for real. After that performance, I promised myself that I would do everything in my power to someday perform in front of a crowd with the same level of stage presence that every member of Stuck Mojo possessed. About six months later Stuck Mojos fourth release, RISING, was in stores. Just as any fan would do, I attempted to diminish my hunger for Stuck Mojo material and acquired their latest effort. I followed the same ritual as before and listened to the album for a week, non-stop, and mastered every elaborate guitar phrase from Mr. Ward. By that time in my five year period of studying the guitar I had noticed that my style transformed and had begun to parallel the style that listeners of the Stuck Mojo material are familiar with. 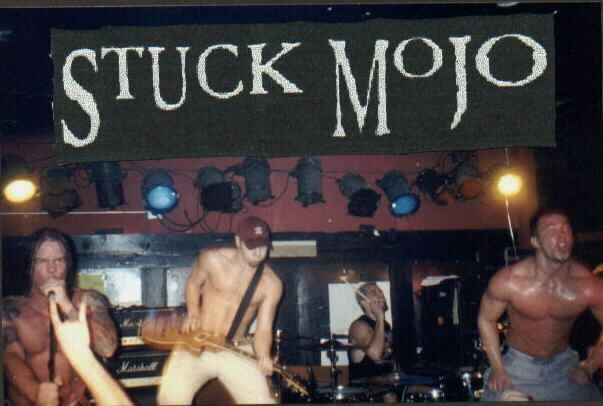 I attended as many Stuck Mojo shows as I could and practiced every disc until it became second nature to play. Now all that was left was to jam with the guy that influenced me more than any musician on the planet. A man who is known as The Duke of Metal. One year after the release of RISING Stuck Mojo experienced some business trouble. Rumors of a separation between the four members of Mojo began to surface. Anyone could figure out that emotions were high-strung after a long year on the road. Corey Lowery, now of Stereomud fame, left the band and Mojo was without a bass player. Mojo did some recruiting and quickly found a replacement. The new bassist, Dan Dryden, provided them with inspiration that seemed to be lacking in the first couple months of 1999. I could see a big difference between one of the last performances with Corey and one of the first performances with Dan. Every show I attended was another opportunity to talk with Rich. He knew who I was by then and talked to me just like I knew him for eons. I remember him reflecting on the troubles the band was having and seemed to have a very uplifting attitude about starting his next venture of musicianship. I told him I would like to jam with him sometime and swap riffs. I had begun to rewrite some of the previous Mojo material and wanted Rich to hear my ideas. A couple weeks later Rich offered guitar lessons in Atlanta. As soon as I found out I signed up and just hoped everything would work out. About a week after I put my name on the list for tutoring from my guitar hero, I met with Mr. Ward in Atlanta. I recall thinking to myself that I could finally jam with the individual that changed my outlook on the art of music. I admit I was nervous, but it was an anxious kind of nervous. He gave me his guitar, plugged me in to one of his Marshalls, and jammed with me for about two hours. I believe Rich enjoyed hearing variations of his music. He was surprised to hear the way I immullated his style. This came from hours and hours of practicing Mojo tunes in my apartment. I was a struggling college athlete at that time in my life. I didnt drink or experiment with drugs so the only thing I had as a release was playing my guitar. And that is what I did, day in and day out keeping my focus on Stuck Mojo material and stamping my own ideas onto each Mojo song. I remember thinking to myself, "if only Rich had a chance to hear my ideas.� Finally, he did and expressed his approval just like I had hoped. I can honestly say that I never thought that a punk kid like me would ever perform with the most amazing live band in the world. 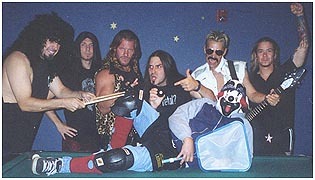 I always dreamed about being a member of a band that could resemble the live energy that Stuck Mojo always delivered to their audiences, but never entertained the thought of me actually performing with the four piece of doom. My goal as a musician had been reached and all by the hands of my guitar hero, mentor, and friend, Mr. Rich Ward.